Well on his way to the 1983 AMA Wrangler Supercross Championship, Team Honda's David Bailey won the Washington, D.C., round, held in Robert F. Kennedy Stadium, home of the NFL's Redskins. His teammate Bob Hannah was second, with Suzuki's Mark Barnett third, Kawasaki's Jeff Ward fourth, and Yamaha's Mike Bell and Rick Johnson fifth and sixth, respectively. All six of the top six in this race would win at least one AMA Supercross Championship in their careers. 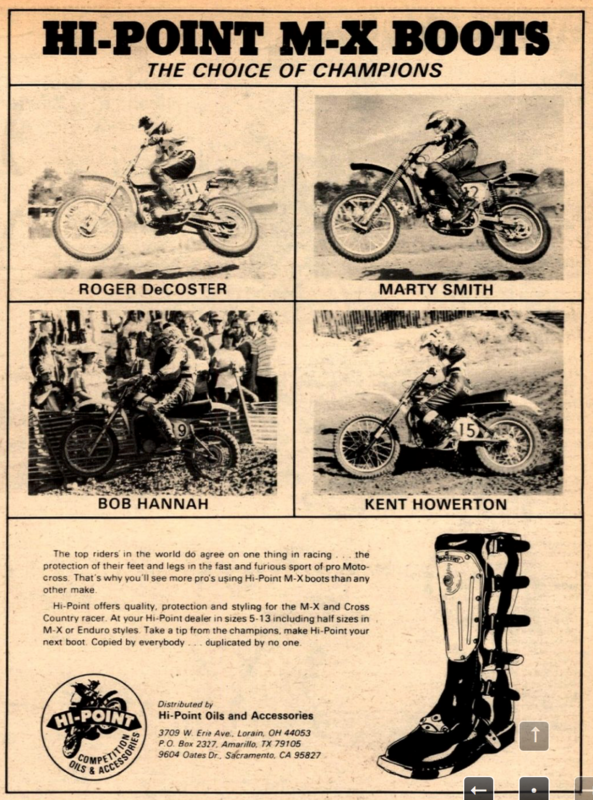 An advertisement in Cycle News for Hi-Point Boots, the U.S. version of Alpinestars, showed some of their top athletes: Roger DeCoster, Bob Hannah, Marty Smith, and Kent Howerton. 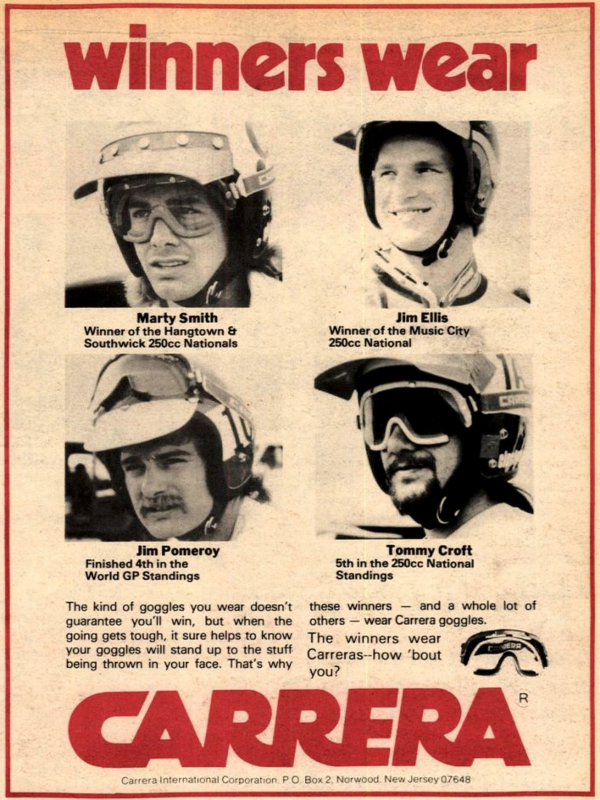 And check out Carrera Goggles' lineup in '77: Smith, Jim Pomeroy, Jimmy Ellis, and Tommy Croft. East Rutherford, New Jersey, was the host of the ninth race of the ten-round AMA Supercross Championship, and Team Honda riders swept the podium. Rick Johnson topped everyone, followed by George Holland and Australian import Jeff Leisk. The win allowed Johnson to clinch his second AMA Supercross title. 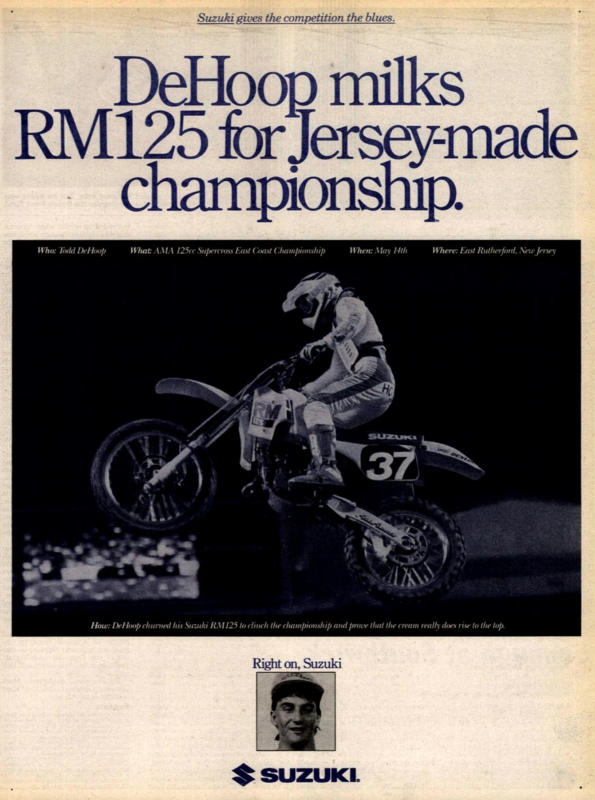 The 125 class win went to Yamaha-mounted Mike LaRocco, with Suzuki's Todd DeHoop second and able to clinch the 1988 125SX East Region title. Kawasaki Team Green's Denny Stephenson was third. 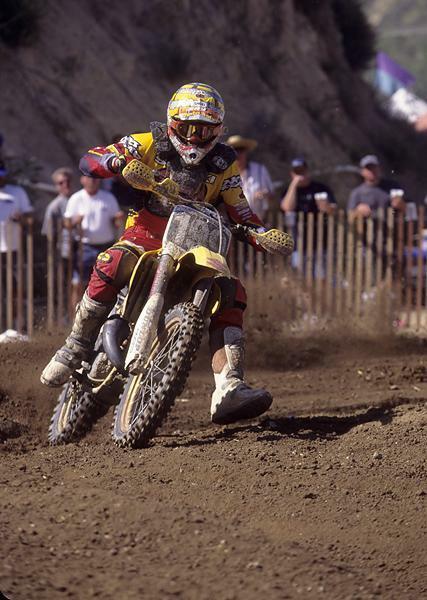 Glen Helen kicked off the start of the 2000 AMA/Mazda Trucks Motocross Championship, and Ricky Carmichael won in his outdoor debut on a KX250 Kawasaki. RC went 1-1 to top the 2-2 of Team Honda's Sebastien Tortelli and the 4-4 of Yamaha's David Vuillemin. In the 125 Class, Yamaha of Troy's Stephane Roncada put in a steady 1-2 set of motos to top the 5-1 of Pro Circuit Kawasaki's Tallon Vohland and TLD-backed Honda privateer Steve Lamson's 4-3. That same day over in Croatia, two riders with a shared future destiny on the AMA circuit battled it out in the FIM 125cc Grand Prix. U.S. hopeful Mike Brown went 1-1 to grab the win while South Africa's Grant Langston struggled to a 12th the first moto, but finished second the next time out.